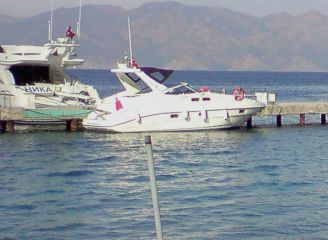 Sealine S34 For Sale is lying in Marmaris, Turkey. At 10.5 metres (approx. 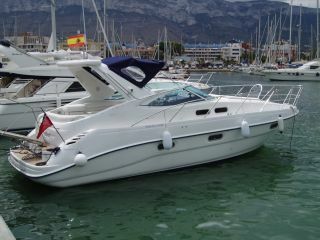 34.45 feet) this Sealine is a bargain at £85,000. Sealine S34 6 berth sports bridge cruiser with a top speed of 32 knots and cruising at 25 knots. The Sealine S34 has a forward cabin with offset double and ensuite toilet & shower, rear cabin offers large double or twin option, plus saloon settee converts to a double. Boatmatch Tip: Want more advice about buying this Sealine S34? Checkout our Boatmatch Buyers Guide! 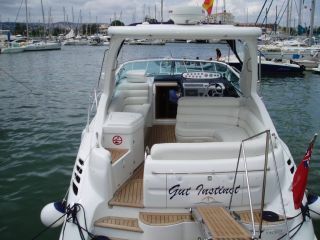 The Electrical Systems of this Sealine S34 - 12v system plus 220v shorepower system. automatic charger. Navionics Gold electronic chart for entire Med region. Boatmatch Tip: Need advice about possibly insuring this Sealine S34? Checkout our Boatmatch Insurance Guide! Additional fire fighting equipment to MCA spec. Full galley equipment including pots, pans, cutlery and melamaine crockery and glasswear for 8.
. 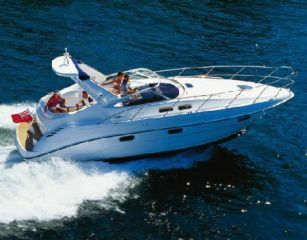 Contact the seller of this Sealine S34 for more details. Rigging & Winches equipped on this Sealine S34 - Electric windlass - reversable with 10kg Delta anchor on 80 metres of chain plus addional Danforth anchor on 5 metres of chain and 35 meters of rope. Forward cabin with offset double, and ensuite to toilet & shower, rear cabin offers large double or twin option, plus saloon settee converts to a double. Galley to port with Gas hob & Oven, sink with hot & cold water, fridge and plenty of stowage..
Boatmatch Tip: Have a question about the accommodation of the Sealine S34? Contact the seller via clicking on the registering interest button above. Offered in pristine condition, with no expence spared and in ready to go condition. Full MCA specification with full inspection carried out 2014. Currently lying Marmaris, Turkey and under charter management – an arrangement which could be continued if new owners wish.